Lily Fajardo could have undertaken her Master of Laws at Georgetown or New York University - she was accepted into both. Instead, the 24-year-old Mexican traversed the globe to complete her post-graduate studies here at Melbourne Law School. It has been a homecoming of sorts – Ms Fajardo studied at Melbourne in 2012 on exchange from Tecnológico de Monterrey in Guadalajara. Her previous experience here made the decision of where to pursue further legal studies so much easier. 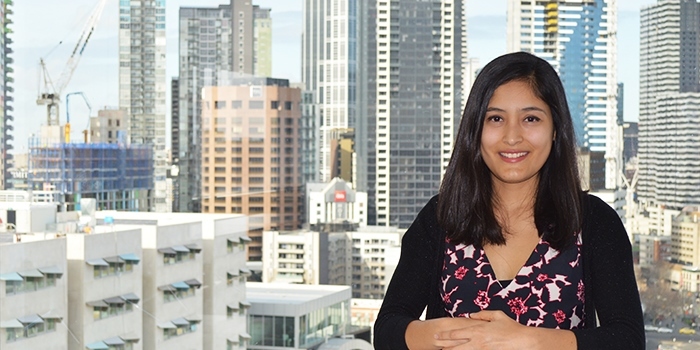 "For me, it was a no-brainer to apply for Melbourne Law School," she says. "Graduate school is such a huge investment so you really have to make sure it is the right time to do it, on both a personal and professional basis, and it has to be the school where you want to do it. "I looked at schools with a strong focus on international law because it's what I want to do, and I had such a good experience last time I was here." Melbourne is also where Ms Fajardo met her now fiancé Jeffrey, an American student on exchange in the same semester as her. "It's quite surreal to be back because my time here was so life-changing," she says. Ms Fajardo's decision to do her LLM here sees the couple on opposites of the world, with Jeffrey working in Philadelphia, but Ms Fajardo is positive that, long-term, coming here will be best for her career. Her MLM combined with her experience at undergraduate level makes for enviable reading. Ms Fajardo completed an internship with the U.S. Department of Defense in Washington, D.C., and a fellowship in the States that also saw her working for a non-profit organization in Chile. Ms Fajardo was also one of just four Mexican students selected as United Nations youth delegates for their country; an experience she says was "mind-blowing" and formative. It has given her a clear sense of where she wants to take her career. "I definitely want to work in something in international law and human rights law. I went into law because I had a really clear idea of what I wanted to do," she says. "My dream job is to work at the UN."